Dark Souls meets Tenchu. That is all you need to know, but here’s more. FromSoftware’s latest game, revealed at last year’s E3, has finally received a name: Sekiro: Shadows Die Twice. This 1500s Japan-inspired title is part Dark Souls part Tenchu, and looks to be in-line with From’s style of offerings. I was lucky enough to sit down and watch a guided demo of Sekiro: Shadows Die Twice, and long-time fans of the Soulsborne game will be pleased with the direction Sekiro appears to be taking. The demo started with the main character perched below a tree, overlooking an ancient Japanese castle. The long drop to the ground is of no consequence thanks to the grappling hook built into the Shinobi Prosthetic - the main character’s off-hand trick-weapon of sorts. With a press of the button, the Shinobi Prosthetic changes its tool from a wooden axe for cutting through enemy shields to a shuriken burst for a ranged attack. Later in the demo, the main character can be seen using an ability call “Blood Smoke”, a massive area of effect mist move that is very expensive to use. Its combat is exceptionally fast, more akin to Bloodborne than Dark Souls, but with the added verticality of grappling, and for the first time in a Soulsborne game, actual jumping. 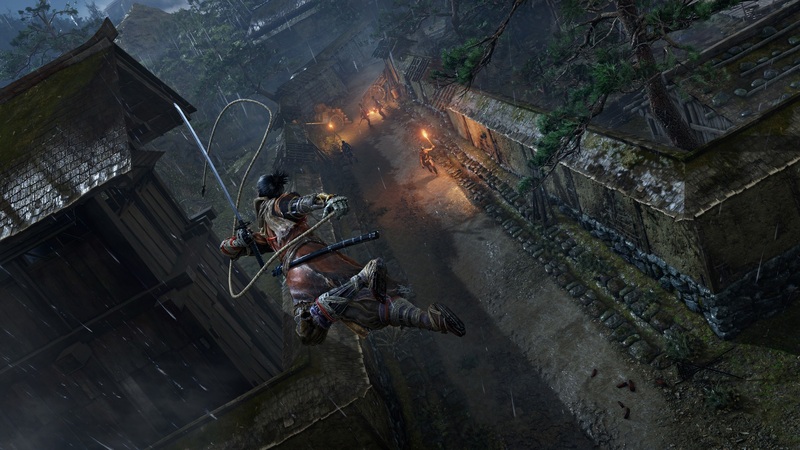 While all the previous titles have a sprint-jump functionality, Sekiro allows the player to immediately jump without the need of the running build-up. Level design utilized a lot of vertical space, consisting of archways and rooftops that the main character ran across in order to get a better position on a group of enemies. After taking down a flintlock sniper with a swift kill, our guide leapt to the ground and engaged the remaining enemies. 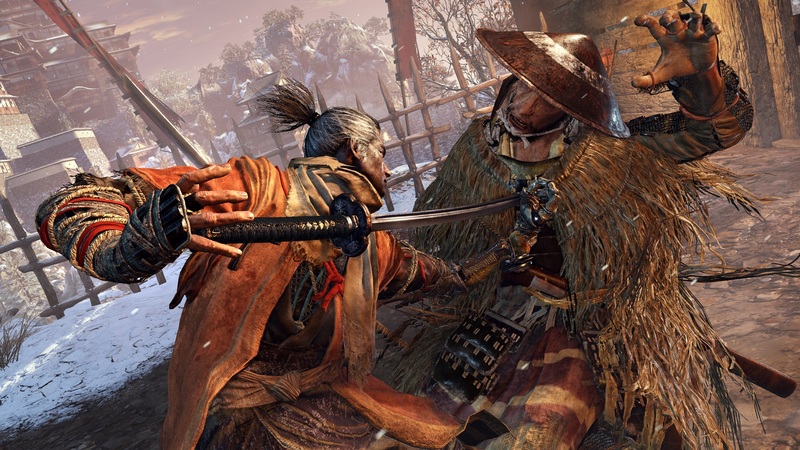 Sekiro introduces a new stamina-like mechanic currently called “Posture.” Whenever a player, or an enemy combatant, successfully parries an attack, they drain the posture of the opponent and when the posture stat reaches a critical level, it places the character at a significant disadvantage and susceptible to a strong attack. 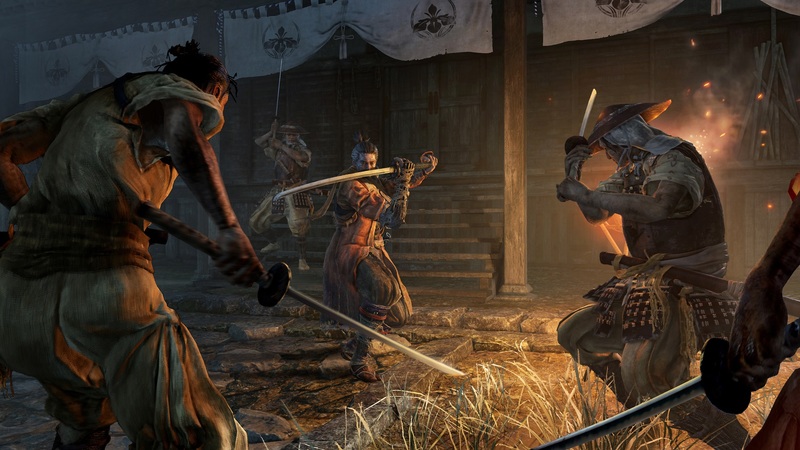 Beyond the combat, Sekiro also utilizes some light stealth mechanics. Entering long grass creates an on-screen effect where the edges are blurred, signifying that the main character is hidden from the view of enemies. He can also stick to the wall and shimmy across walls to avoid being seen. Not a lot of story was revealed, and the guides made a point of stating that Sekiro: Shadows Die Twice is not heavily story driven, which should be a sweet melody for those who love the obscurity of the Soulsborne titles. The snippet of story on display showed off The Young Lord, whom the player character serves. Unfortunately, the Young Lord gets kidnapped near the start of the game for his bloodline, and when attempting to retrieve him, the protagonist loses his arm. This is where the name of the game comes into play. While Sekiro isn’t the name of the protagonist, it does mean “one-armed wolf”, which is an accurate description of the main character. 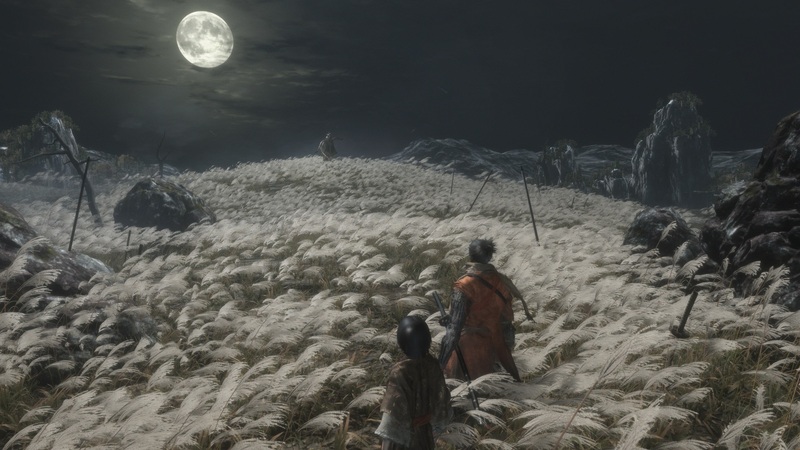 In terms of choosing the character you play, it was noted that Sekiro: Shadows Die Twice deviates from the norm in that it offers no class suggestions or options, instead, the main character is a ninja and that is what the player will play. Furthermore, it’s not a stat-based game like Dark Souls or Bloodborne, the focus is on upgrading gear, though this will work in a different way. As we watched the guide play through, he took a path down a ravine, using the grappling hook to leap from outcropping to outcropping, all while avoiding a giant serpent. Though the encounter with the serpent was merely “run away”, it was promised this encounter would be larger in the game. Hidden in this canyon was a Shinobi Door, a wooden passage used by ninjas to get around unnoticed, which the player can use as a kind of shortcut. The playthrough reached its climax with a multi-phase boss fight against an opponent called the Corrupted Monk. The ideology of the “clash of swords” was evident during the fight on every successful block - a bone-rattling clang would reverberate out across the boss arena as sparks flew from the katana. After a certain amount of damage was dealt (the HUD was off so no real information was evident), fog rolled in and the monk split into several shadows that constantly assaulted the guide. The attempt came to a close with a swift death of our guide, followed by the words “DEATH” appearing on-screen. Though it was a short live demo, and despite the HUD being turned off, what was shown looked exceptionally promising. The combat looked slick, responsive, and offered enough differences to feel fresh while retaining enough similarities to feel familiar. With Hidetaka Miyazaki at the helm, and with how good Sekiro: Shadows Die Twice is looking, I’m quietly confident this will become one of my favorite games when it launches sometime in early 2019 on PlayStation 4, Xbox One, and Steam. But I’m surprised Craddock wasn’t on it. Or will he be giving his take too? Also interesting to get confirmation that it’s not that plot driven after all. I also want to hear Craddock's take.